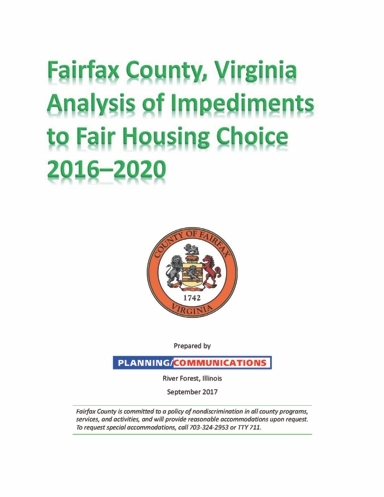 Fairfax County, Virginia (2017) — Conducted the Fairfax County, Virginia Analysis of Impediments to Fair Housing Choice 2016–2020, a 299–page study of housing, land use, transportation, employment, demographics, real estate practices, mortgage lending, and other factors that influence fair choice housing in one of the wealthies counties in America. While Fairfax County has become increasingly racially and ethnically diverse since 1980, the proportion of African American households continues to fall significantly short of what you would expect in a genuinely free housing market undistorted by discrimination. In more than 82 percent of the county’s census tracts, the proportion of African American households is significantly less than would be expected if Black households were able to live where they can afford to live in Fairfax County. Closely related to racial and ethnic demographics, is the serious shortage of Fairfax County housing affordable to households of modest means. This report offers the most thorough explanation yet of the Free Market Analysis™ used to fairly estimate the extent of housing segregation. Clark County, Nevada (2011)  Researched and produced the Clark County, Nevada Analysis of Impediments to Fair Housing Choice 2011, an innovative 140page study of housing, land use, transportation, employment, demographics, real estate practices, mortgage lending, and other factors that influence fair choice housing in unincorporated Clark County, Boulder City, Mesquite, and North Las Vegas. 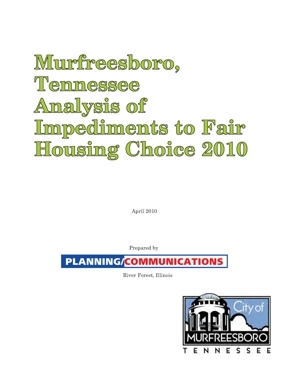 Murfreesboro, Tennessee (2010)  Researched and produced the Murfreesboro, Tennessee Analysis of Impediments to Fair Housing Choice, a 92page study of housing, land use, transportation, employment, demographics, real estate practices, mortgage lending, and other factors that influence fair choice housing in this major Tennessee city that is home to Middle Tennessee State University. Naperville, Illinois (2007)  Researched and produced the Analysis of Impediments to Fair Housing Choice in the City of Naperville, Illinois, 2007, a 79page study of housing, land use, transportation, employment, demographics, real estate practices, mortgage lending, and other factors that influence fair choice housing in this major Illinois city. Received 2009 Best Practices Award from the Illinois Chapter of the American Planning Association. This is the AI that experts have very kindly described as reinventing the genre. The AIs shown above it have further refined the genre. 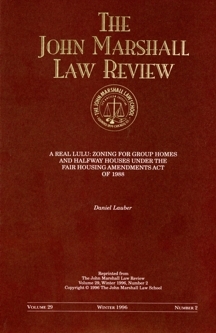 “A Real LULU: Zoning for Group Homes and Halfway Houses Under the Fair Housing Amendments Act of 1988,” in The John Marshall Law Review, Winter 1996, pp. 369407. “Group Think,” in Planning magazine, October 1995, pp. 1113. Recommendations to the Illinois General Assembly on Zoning for Community Residences, Jan., 1991, 44 pp. 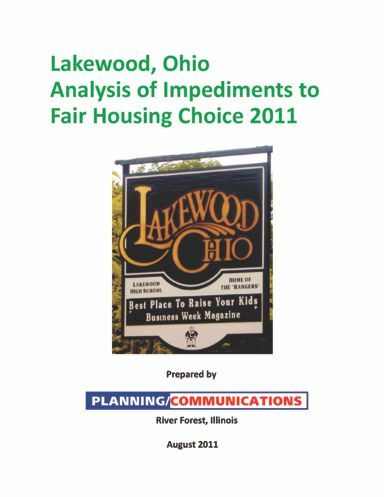 Prepared for the Illinois Planning Council on Developmental Disabilities, this report identifies proper zoning techniques and reviews the results of a state project to bring the zoning ordinances of 110 home rule municipalities into compliance with the 1988 amendments to the Fair Housing Act. 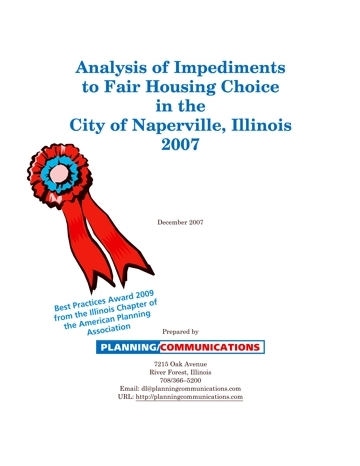 Received 1991 Award for a Planning Program of Unusually High Merit Performed Under Serious Budgetary, Manpower, or Political Constraints from the Illinois Chapter of the American Planning Association. Community Residence Location Planning Act News, June 1990, 4 pp. and Aug. 1990, 14 pp. The June issue answers questions about the Illinois Community Residence Location Planning Act. The August issue contains model zoning provisions for each of the legal zoning approaches suggested in the compliance guidebook described above. 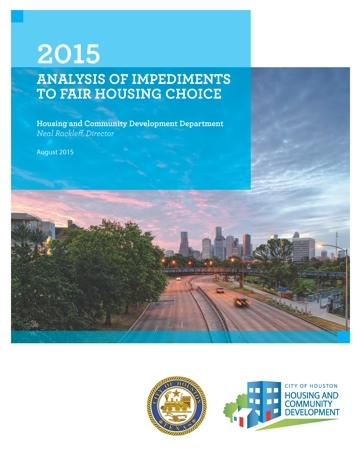 The August issues also includes zoning recommendations for halfway house and hospices and a sample application form for administrative occupancy permits. 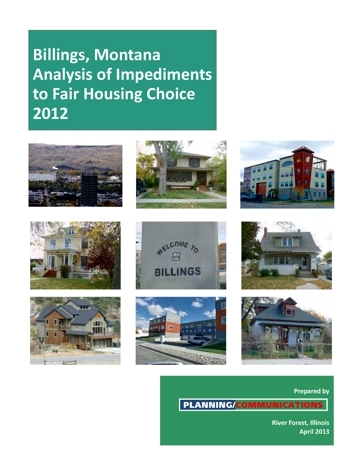 Detailed commentary explains the why and wherefores of each zoning provision. “Avoid Zoning Pitfalls for Community Residences,” in The Suburban Housing Newsletter, Summer 1993, pages 13. Community Residence Location Planning Act Compliance Guidebook, May 1990, 47 pp. Explains how group homes operate, whom they house, the 1988 amendments to national Fair Housing Act, and court decisions under the 1988 amendments. 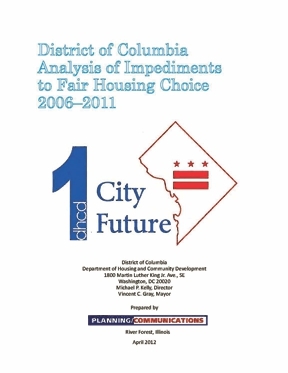 Suggests four zoning approaches that comply, to varying degrees of certainty, with the Fair Housing Act. Identifies zoning approaches that certainly violate the act. 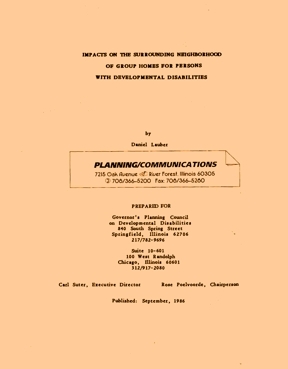 Appendix includes executive summary and bibliography from Lauber's 1986 study on the impacts of group homes on the surrounding neighborhood. “Nation's Hottest Zoning Issue: Fair Housing Act Allows Zoning for Group Homes,” in Housing & Human Services Quarterly, American Planning Association, Fall/Winter 199091, pp. 13. “Fair Housing Act Allows Zoning for Group Homes,” in Planning & Zoning News, March 1990, Vol. 8, No. 5, pp. 1819. 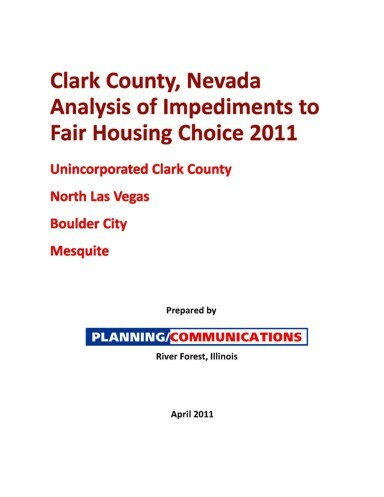 This article offers a preliminary evaluation of how the 1988 amendments to the Fair Housing Act affect zoning for group homes. “Mainstreaming Group Homes” in Planning, Dec. 1985, pp. 1418. Toward a Sound Zoning Treatment of Group Homes for the Developmentally Disabled, May 1985, 103 pp. Guide to Chicago Zoning, Illinois Department of Mental Health and Developmental Disabilities (Illinois Department of Mental Health/Developmental Disabilities), April 1981, variable pagination. “But unless the action and policies called for here are adopted and implemented within the next few years, America’s middle class faces an otherwise unavoidable housing disaster, the likes of which we have not seen since the Great Depression.” — Daniel Lauber, written testimony March 31, 1981. Written and oral testimony to Congress by Planning/Communications’ President Daniel Lauber explains how unbridled conversion of profitable and affordable rental housing to condominiums in the late 1970s and early 1980s wiped out much of the nation’s affordable rental housing, contributing to inflation in housing costs and leading to the growing affordable housing crisis of the past 30 years. Just about everything he warned would happen has happened. And once the rest of the housing industry adopted the practices of the condominium converters, that “unavoidable housing disaster” of which he spoke came true in the past decade. Comprehensive Plan 1979, Village of Oak Park, Illinois. Award–winning comprehensve plan hailed in a Planning Advisory Service Memo as a model plan for other communities to emulate. 71 pages. Received 1983 Award of Merit from the Illinois Chapter of the American Planning Association. “Zoning Hearing Examiners Rescue Cities, Counties from Administrative Tangles, Rising Court Appeals,” in Innovations, Illinois Department of Local Government Affairs, Jan. 1977, pp. 1011. “SociallyInformed Planning and Decision Making: Some Preliminary Ideas,” in Intergovernmental Planning, Approaches to the “No Growth” vs. “Growth is Good” Dilemma. Proceedings of the Annual Summer Institute on Zoning and Planning, 1976, Bureau of Urban and Regional Planning Research, University of Illinois, 1976, pp. 2951. The Hearing Examiner in Zoning Administration, PAS Report No. 312, ASPO, 1975, 26 pp. Zoning for Family & Group Care Facilities, PAS Report No. 300, ASPO, March 1974, 30 pp. Frequently reprinted and entered as evidence in court cases. 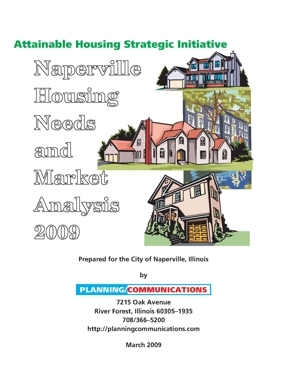 Established first model zoning guidelines for community living arrangements. Recent Cases in Exclusionary Zoning, PAS Report No. 292, ASPO, June 1973, 33 pp. Reprinted as chapters on exclusionary zoning in Management & Control of Growth: IssuesTechniquesProblemsTrends (Urban Land Institute, 1975, Vol. I), and in Land Use Controls: Present Problems and Future Reforms (Center for Urban Policy Research, Rutgers University, 1974). “Racially Diverse Communities: A National Necessity,” a chapter in African Americans in Urban America: Contemporary Experiences, Wendy Kellogg, ed., Kendall/Hunt Publishing Company, 1996, pages 180200. Originally published as a chapter in Challenging Uneven Development: An Urban Agenda for the 1990s, Phillip Nyden and Wim Wiewel, eds., Rutgers University Press, 1991, pp. 4984. The document here is the full monograph which was condensed for both books. Government Job Finder, 3rd edition, Planning/Communications, 1997, 325 pages. Book review of “Breaking New Ground: Developing Innovative AIDS Care Residences,” in Journal of the American Planning Association, Winter 1994, pp. 124125. “The More Things Change,” commentary in Journal of the American Planning Association, Autumn 1993, page 486. Governors’ Planning Council on Developmental Disabilities, Sept. 1986, 36 pp. Two printings. “Condominium Conversions: A Reform in Need of Reform,” Chapter 16 of Land Reform, American Style, Frank J. Popper and Charles Geisler, eds., Rowman and Allanheld, 1984, pp. 273301. “Viewpoint,” (revive lowequity cooperative housing programs) in Planning, April 1984, p. 18. Achieving the Promise of Housing Receiverships, Lawyers Committee for Better Housing, August 1983, 27 pp. The Compleat Guide to Jobs in Planning and Public Administration, Planning/Communications, May 1982; second edition, 1984, 44 pp. Impacts of Group Homes on the Surrounding Neighborhood: An Evaluation of Research, IDMH/DD, August 1981, 22 pp. “Towards a Rational Housing Policy: The Role of Condominium Conversions,” in Condominium and Cooperative Conversion: The Federal Response, U.S. Government Printing Office, 1981, pp. 284316. “Condo conversion laws: the next generation,” in Planning, Feb. 1981, pp. 1923. “Condominium conversions  the number prompts controls to protect the poor and elderly,” in Journal of Housing, April 1980, pp. 201209. The Compleat Guide to Jobs in Planning, Planning/Communications, March 1976, second printing 1977, 16 pp. “Social Planning, Vancouver,” in Planning, March/April 1975, pp. 1921. “The Housing Act & Discrimination,” in Planning, Feb. 1975, pp. 2425. Job Descriptions for Planning Agencies, PAS Report No. 302, ASPO, May 1974, 22 pp. “Some Tips on the New Housing Act,” in Planning, Nov. 1974, pp. 2123. “Oak Park: Integration Takes More Than a Racial Quota,” in Planning, April/May 1974, pp. 1417.